Some better quality snaps of the Freestyle in it's Absolute Black shade. Wooah! Absolutely looks smashing. I am so drooling over the freestyle now. And if I get one, it will have to be Black. The only thing holding me back now is the lack of an AT. C'mon Ford, get us that AT quickly - and I'll easily trade in my Ecosport AT for this. Not that I have any problems with the ES (it's practically as good as when it was brand new); just that it is nearing 5 years and the new car bug is beginning to nibble. Not sure if enough people have bought the Freestyle here or not, but thought to ask this question. 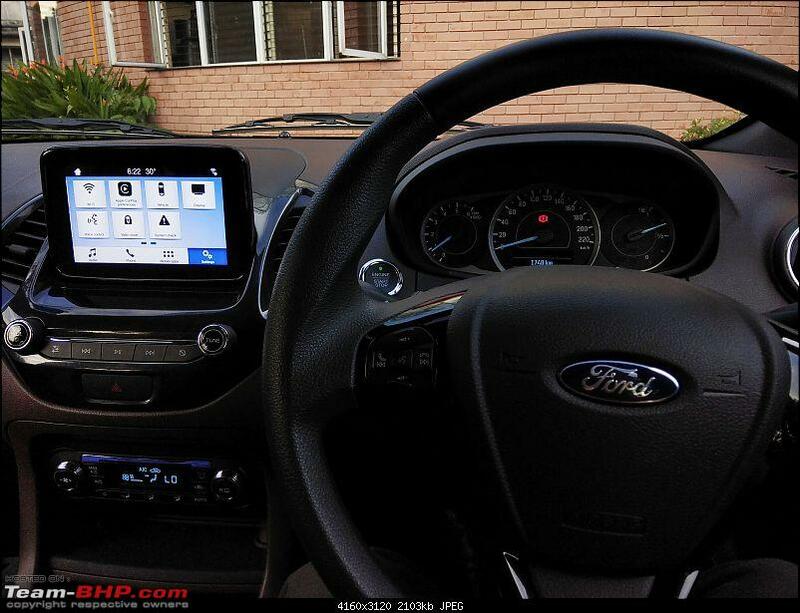 Has anyone faced any issues with the Fly Audio touchscreen unit (non Sync3) as reported by some facelift EcoSport owners? I have recently bought freestyle titanium petrol. So far, i have not faced this issue of screen freezing and washed out display. Hope this issue doesn't occur in freestyle. 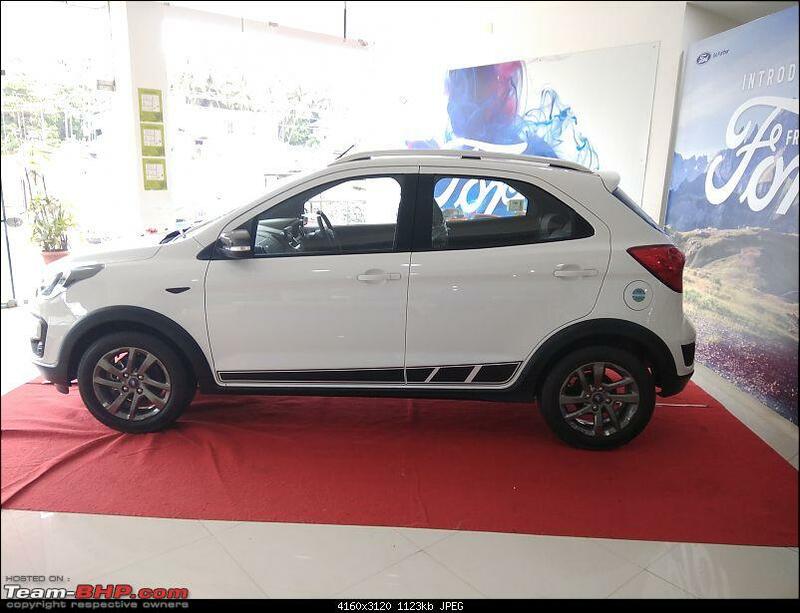 I was planning to replace my Grand I10 with Figo diesel. 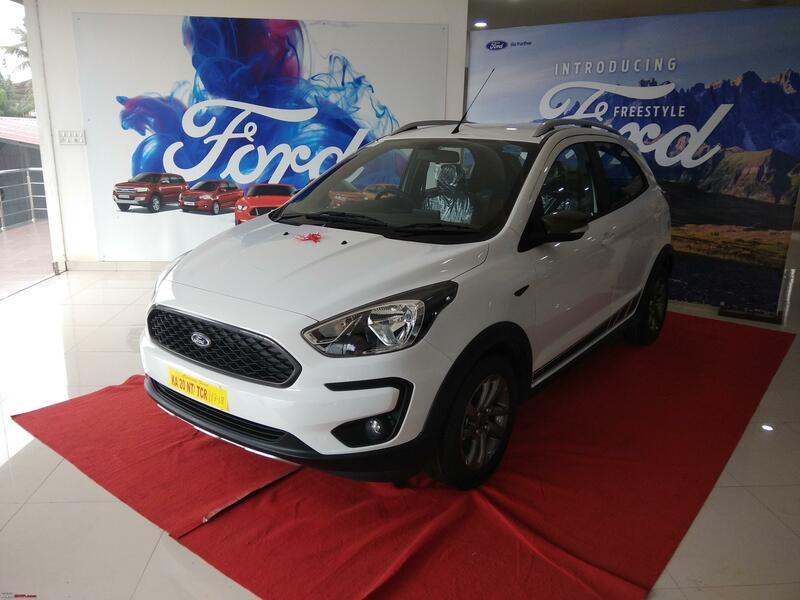 Ford launched Freestyle with killer pricing and all the positive reviews obviously made me consider it too . I have driven Figo before, but wanted to compare both cars back to back. 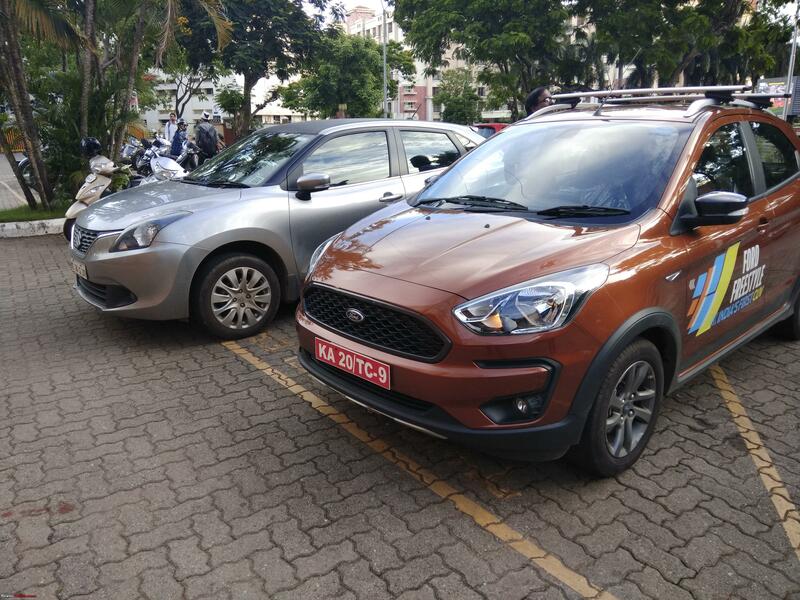 Ford dealer arranged test drives of both Figo and Freestyle. I am happy to report that all the negatives I had observed in Figo have been corrected in Freestyle. 1. Freestyle has better road presence than Figo. Loaded with more features too. 2. Ride quality is better than Figo. 3. NVH levels felt slightly better. 4. Gearshifts : What a huge improvement in Freestyle! There was a click after slotting in and shifts were much smoother. 5. Horn sound was weird in Figo. It felt like horn was present inside the cabin and too loud. No such observation in Freestyle, better insulation? 6. ABC pedal area felt very tight in Figo. Even in Freestyle, the spacing looked similar. But you sit higher, may be that helps and I didn't find it uncomfortable. 7. Surprisingly, handling was better in Freestyle. I expected Figo to be better due to low GC. Not sure if tyre pressure was not right in Figo. 8. Braking was good. Initial bite was strong. I did not get to test braking under high speeds. 9. You sit much higher in Freestyle and it does make you believe that you are driving a car bigger than Figo . 10. Ford 1.5 D has good mod potential. A simple remap can bump up the power to 130 HP. Even in stock map, performance is very good. There is almost nil lag and car did not struggle and picked up speeds from 1000 rpm. I loved flooring the car in 2nd gear, very good pull. After driving both cars, I am very much inclined towards Freestyle. 1. Front armrest : Ford should have given this, missed the opportunity. 2. Steering leather wrap : I liked it in Figo S.
The dealer has quoted waiting period of 6 weeks and the booking amount is Rs. 11,000. If everything goes as per the plan, Freestyle should be in my garage by August. Well doctor on a lighter and maybe off topic start we always expect a suggestion from you regarding a remap especially of a diesel engine! I've already booked a Titanium Plus Petrol and hopefully will get delivery this weekend. I loved the steering and the petrol engine is also fun. Though not as much fun as the diesel. Compared to my friend's Grand i10 I found it to be a bit more sprightly and also a bit more comfortable and definitely better to drive. (I'm not a fan of most Hyundai power steering systems). Besides it has all the safety features which wouldn't look out of place on a 15 Lakh rupee car. Haha!! Once you get used to extracting more power, remap can't be ignored. Mod potential has become one of the major criteria during my car purchase . Congrats! I have not driven the petrol yet. I have got Baleno 1.2 petrol in my garage, that's the major reason for not considering petrol Freestyle. And yes it's diesel for me because of easy mod potential . Planning to book in couple of days, need to say bye bye to Grand I10. Full marks to Ford. ESP, 6 airbags and what not. Even my S-Cross 1.6 which cost me 15 lakhs doesn't have it. I have recently bought freestyle titanium petrol. Congratulations on your buy, looking forward to an ownership review from you. How is the car while doing speeds around 100km/hr. Does the engine sound stressed? or does it have more juice left in it? Seriously considering this as my next car. Confused between Baleno and freestyle Petrol. However if you're confused between baleno and freestyle, I personally find baleno a better choice, specially for the space it offers. Freestyle is simply a size smaller. Engine - gearbox combos offered on these two cars are both equally brilliant. Baleno's engine is not as free revving as it used to be in it's first avatar in the type 2 gen 1 swift. Still, being the lighter one, 0-100 timings could be better on the Baleno, but then it is hardly relevant. Coming to build quality inside and outside, suspension, steering feedback, it is the Freestyle that scores above the Baleno. The Freestyle is more a driver's car and it absorbs rough roads better, so keeping all the occupants happy. Baleno gets marginally better space but there is no headroom in the rear. Tall ones will find it difficult to sit in the rear of the Baleno whereas Freestyle's rear headroom is quite ok. If you need a faster car, you should wait for regular Figo updated version. It should sit lower, be lighter and go faster. Area where freestyle scores is w.r.to practicality. Correct. I believe even Figo facelift would get the new gearbox. As of now Freestyle is a clear winner over Figo. Let's see how Ford prices the Figo facelift and the features available. As a Baleno (petrol manual), I would not recommend Baleno to you. Its outside metal is unbelievably thin. The front doors are thin but rear doors are even thinner. Also it is very easily susceptible to dents. Because of this I am very nervous to take my toddler for a trip in my car. Also I try to avoid unnecessary trips. If you consider safety, better stay from this car. Don't get fooled by DRL, HID lights. You can have aftermarket fitments in the Freestyle after some months. Just found this paragraph while going through user manual of ford freestyle, it clearly says that except during startup, at no other point the gear should be engaged with engine speed below 1250 rpm. Does this mean that the 1.2l dragon petrol engine needs minimum 1250 rpm to start delivering torque / power down the wheels. Also I am curious to know the 'power vs rpm' and 'torque vs rpm' graphs for this 1.2l dragon petrol engine. While the same for 1.5l dragon petrol engine is readily available on the Internet, I could not find it for this engine. IMO, it's something more generic than specific to an engine. People lug their engines in greed of more fuel economy upshifting really early, to keep the engine RPM as low as possible. This is absurd and should be avoided. The fun with the dealership has begun . I called them today as they had said that the car should arrive by the 7th of June. They said that there is a delay and the car hasn't been dispatched from Gujarat due to some "GST Issues". But they said they have a chassis/vin number. I told them to provide me that and also asked them how they claimed that the car would reach by 7th when it hadn't been dispatched. Thankfully I didn't make the payment they had requested earlier so currently only the booking amount of 10k is with them. I plan to give them another 10 days or else I'll probably write to Ford and ponder whether to cancel my booking. 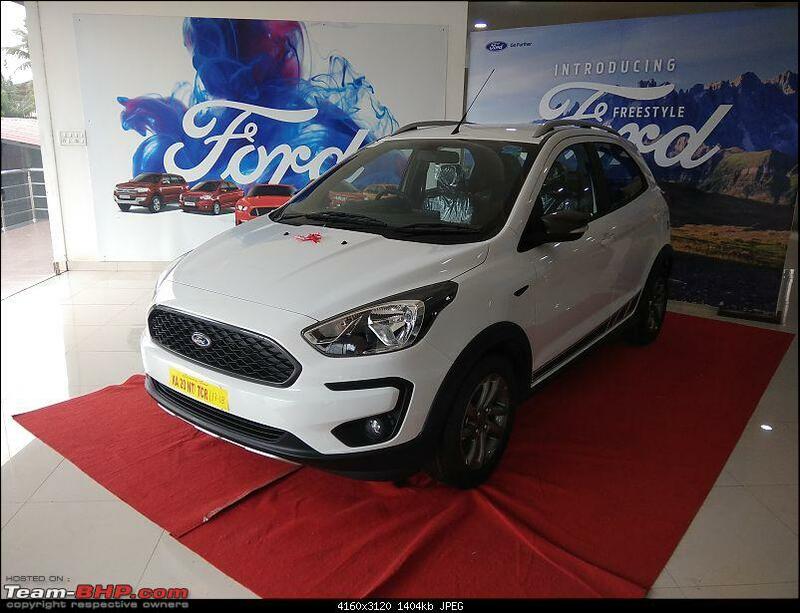 I know the car is good but their absolute lack of communication has my family asking me why I chose Ford instead of say Maruti or Honda or Tata even. All times are GMT +5.5. The time now is 18:37.